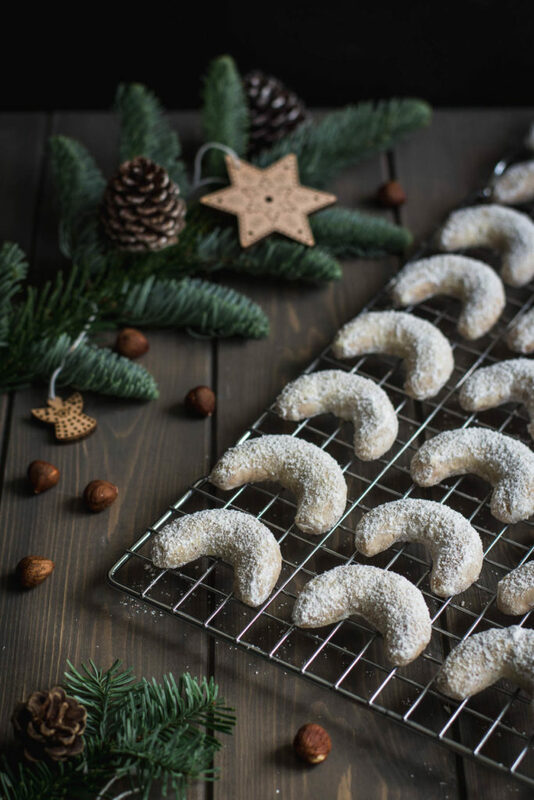 I love making Christmas cookies that I bring home when visiting my family, sharing it with my friends, colleagues and my partner’s family. It may not seem so though on the blog yet as there is only one recipe so far which is the one for chocolate coconut prunes filled with marzipan (btw very delicious, have you tried them yet?). 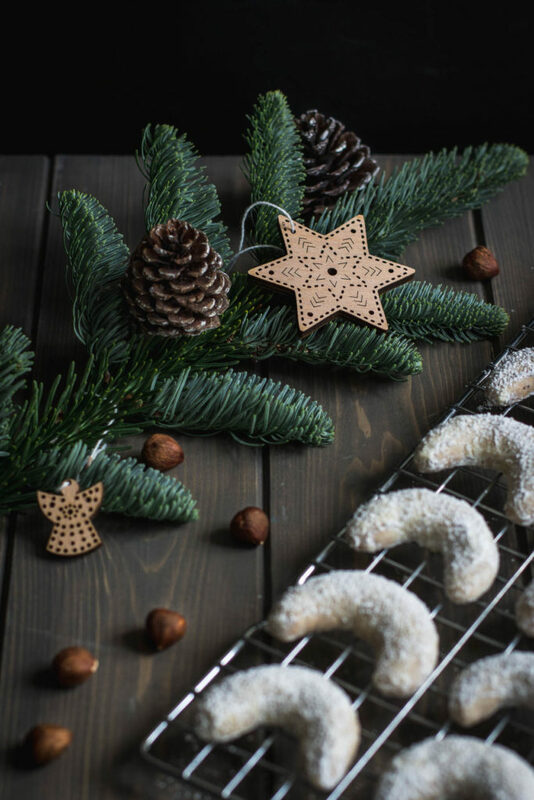 This year I thought it’s again about time to share more of my favorite Chrismas cookies recipes with you and so here come my hazelnut vanilla crescent cookies with praliné! 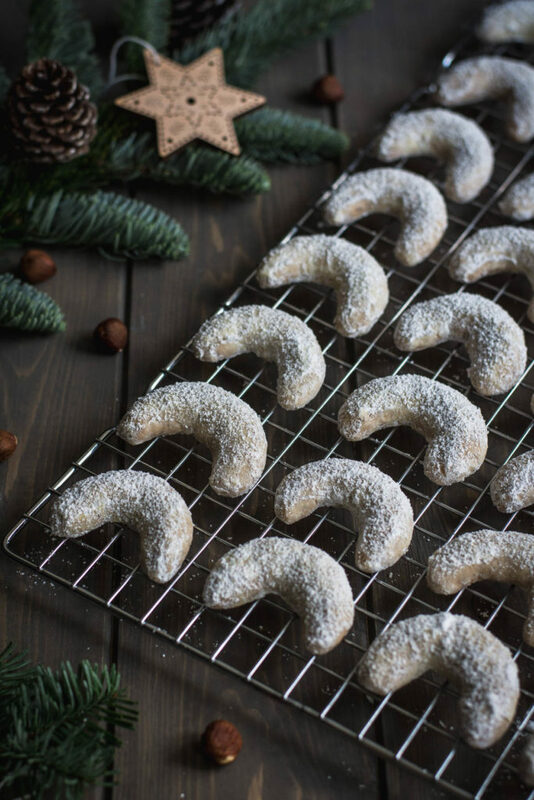 These are one of the most traditional Czech Christmas cookies, I just added some hazelnut praliné instead of the full dosage of butter and sugar. I always make them using the hazelnuts (not walnuts) as this is how my beloved grandma did them. So I really don’t know how shall I manage everything once I’ll have a family… 😀 This will be a challenge I guess. But one thing is for sure, I will not stop making Christmas cookies! 😀 How do you enjoy the Advent? Do you prefer to take it slowly or you also end up being busy every year? 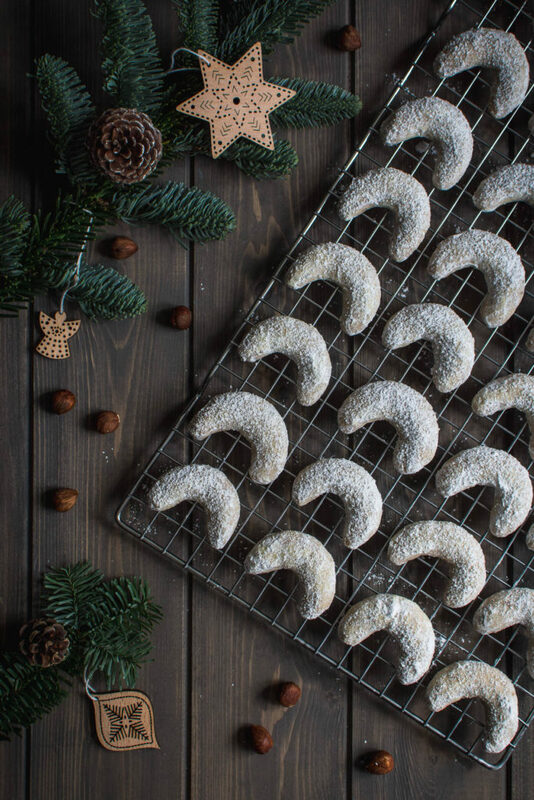 Here is my recipe for hazelnut vanilla crescent cookies with praliné and I hope you will enjoy them! If you give them a try, please do let me know how did they turn out, rate the recipe or share it further! All the ingredients must be at room temperature. If you are using chocolate with praliné filling, let it first melt in a baine-marie and allow to cool down. Grease the baking sheet(s) ( you will need two of them or do the work in two batches). Toss the flour with powder sugar and ground hazelnuts, add softened butter, praliné, and the egg yolk. Work out a dough and make a ball, wrap it in a plastic wrap and store overnight in a refrigerator. 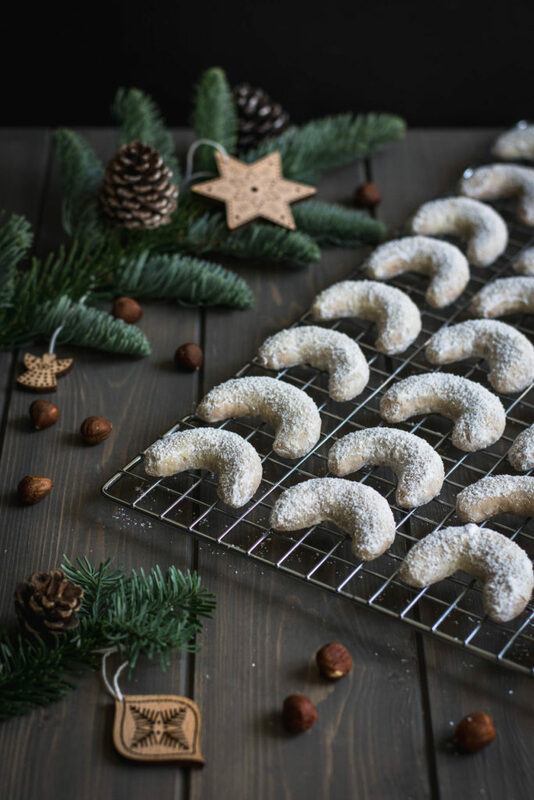 The day after, take out the dough from the refrigerator and once ready to be worked out, cut off small pieces of the dough, shape them into crescents and place them on a baking sheet greased previously. Bake in a preheated oven to 150°C for about 10-15 minutes. Allow to cool down a bit for about 5 minutes. In the meantime, combine the powder sugar with vanilla sugar and coat each still warm crescent with the mixture. Store in an airtight container in a cool place. 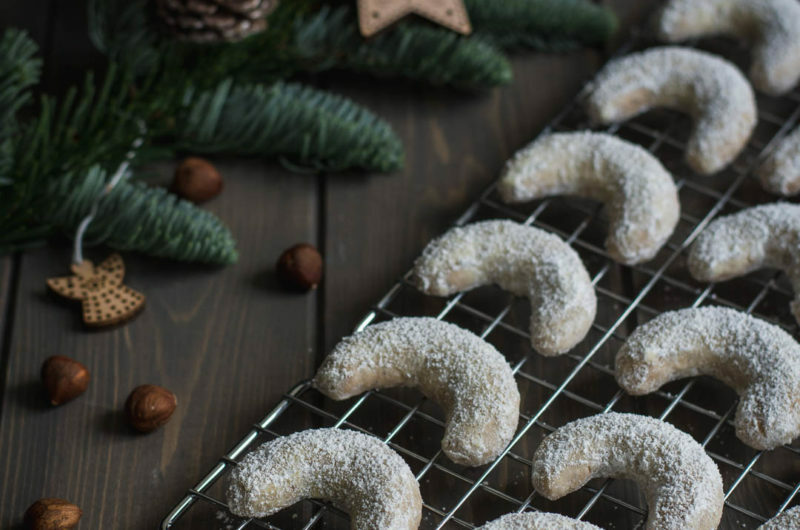 These hazelnut vanilla crescent cookies will keep for several weeks.